Skip the hard-to-get restaurant reservations and treat your sweetheart to a romantic dinner at home. Nothing gets the heart racing like a warm bowl of pasta! I’m often inspired by dishes I’ve had in restaurants that I then try to recreate at home. Here, I’ve taken a saucy rigatoni dish and topped it with a dollop of creamy goat cheese that melts into the hot pasta creating a bowl of heaven. I like to serve this with a nice glass of red wine, sauteed kale and some crusty French bread (made by my husband). And for dessert, my favorite sugar cookies! Meanwhile, in a large skillet, brown sausage on medium-high heat until caramelized and cooked through. Remove sausage to a paper towel-lined plate. In same pan over medium-high heat, add olive oil and then the onion and bell pepper. Cook until softened while scrapping up brown bits from bottom of the pan, about 3 minutes (add a splash a stock, white wine or water to aid this process, if necessary). Add garlic, oregano, and pepper flakes and cook more minute. Season with salt and pepper. Add tomato sauce and gigante beans. Lower heat to medium-low and bring to a simmer. Check seasoning and add more salt and pepper, if needed. If sauce tastes too acidic (slightly sour), add a teaspoon of sugar. Cook rigatoni accordingly to package directions until al dente (about 9-10 minutes). In last minute of cooking, remove 1 cup of pasta water from pot (I do this by ladling it into a glass liquid measuring cup). Drain cooked pasta and add to skillet with sauce over medium-low heat. Toss to coat and add small amounts of reserved pasta water as necessary (2 tablespoons at a time) to create a nice coating of sauce on all the noodles (not all of the reserved cooking liquid will be used). Continue to toss or stir for one minute. Turn off heat and mix in Pecorino or Parmesan cheese. Divide into two pasta bowls and top each with half of the goat cheese. Sprinkle with chopped basil. Enjoy! Check out Mary’s blog for more recipes and tips! Happy Valentine’s Day to all of you lovebirds! 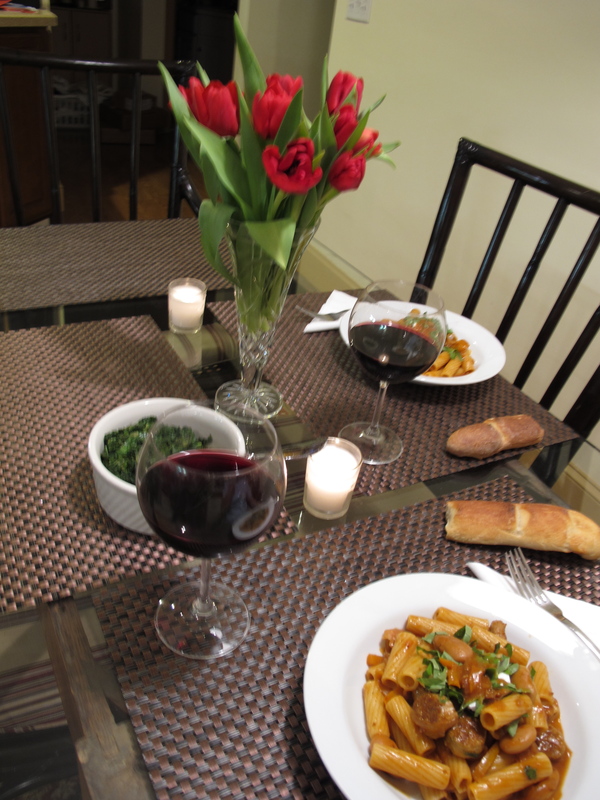 This entry was posted in eats and tagged italian dinner recipe, mary nolan recipe, recipes, rigatoni, valentine's day recipe. Bookmark the permalink.